The start-up scene is thriving in Australia. While we are not quite at Silicon Valley or Israeli-innovation levels, it seems the world is taking notice, particularly after Atlassian’s IPO became the biggest of any Australian company listing on a public sharemarket. Atlassian’s record-breaking valuation was AU$6.1BN after being substantially oversubscribed. It will have many Australian start-ups looking to follow suit. One start-up that is making waves is Shoes of Prey, the start-up that pioneered on-demand customised fashion footwear globally. Shoes of Prey recently announced a US$15.5 million Series B capital raising. Shoes of Prey is changing the way people access fashion, by giving them the power to design their own shoes online and choose from trillions of combinations of style, heel height, material, colour, size and width. Women across the world have designed more than five million shoes on Shoes of Prey since the company was founded in 2009. Earlier this year the company rolled out physical design studios in six Nordstrom stores across the US. The brand is now also available on Nordstrom.com, which establishes an important new sales channel for Shoes of Prey. 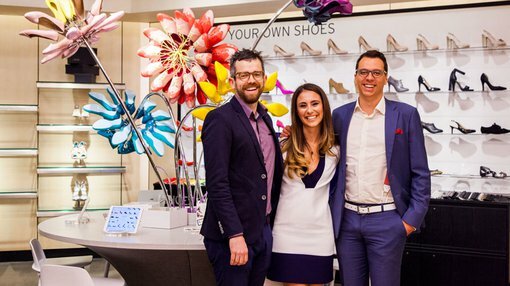 Shoes of Prey will use the funding to continue growing its omnichannel retail presence in the US. The funding will also increase production capacity in the company’s dedicated factory in China to cater to increased consumer demand in the US and globally for customised products, and to accelerate future expansion into new products, starting with women’s handbags. Following the relocation of the brand’s headquarters from Sydney to Los Angeles earlier this year, Shoes of Prey is also aggressively hiring to support its rapid growth, currently at 120 per cent year on year. Jodie Fox, Co-founder of Shoes of Prey, said “Our mission is to empower customers to shop without compromise. Our customers know exactly what they want in shoes, regardless of whether it’s in stock or in season, and we’re proud to deliver a solution that caters to that otherwise unserved need. “The Nordstrom investment follows a number of acquisitions of, and investments in, innovative retail companies in recent years, and shows the company’s continued commitment to offering customers an unparalleled shopping experience. It was an easy decision for us to welcome Nordstrom, the leaders in shoe retail and customer service,” Fox said. Another Australian business who could do big things is Omniblend Innovation, who has recently entered into a binding agreement with EVE Investments for Eve to acquire a 40% stake in the company. EVE will publicly list Omniblend Innovation within two years. The company is finalising a production ready patented food-grade pre-meal drink named GlucoSmoothTM for managing type 2 diabetes. The product is expected to be on pharmacy shelves early in 2016, with a distribution deal already in place to put the product on 6000 Australian shelves. A new report predicts diabetes will be a $55.3BN global market by 2017, with over 387 million people managing the disease. In 2012 alone the antidiabetic medicines industry generated $35.6BN. While Omniblend’s primary markets will be in Australia, New Zealand, China and the US, that’s a big enough slice of the pie to make an impact. Add companies such as the IoT Group making their mark in wearables and home technology, MGC Pharmaceuticals who could capitalise on the growing positive sentiment towards medical marijuana, XTEK who are evolving the military drone and armour space, Newzulu affecting the media landscape and Activistic (who are making donations more palatable by actually giving more back to a charity than is currently being taken by organisers and payment processors) and we have an exciting and emerging group of start-ups making their mark. The start-up scene is thriving across the country, with Sydney leading the way and the few start-ups here are just a drop in the ocean.